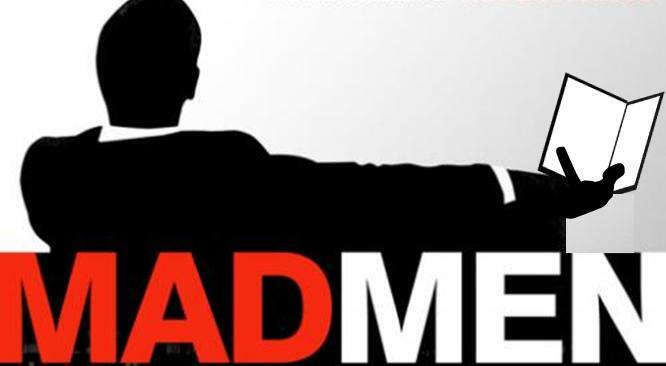 You may be one of many who are excitedly gearing up for the long-awaited return of Mad Men on March 25th. But are you also one of the few who will be keeping an eye out for any literary references season 5 might bring us? There have been a few good books referenced over the course of seasons 1-4. Some, like Lady Chatterly’s Lover and The Sound and the Fury, have received only passing mentions. Others, like Frank O’Hara’s Meditations in an Emergency and Leon Uris’s Exodus have popped up on Don’s bedside table, and have presumably affected his story arc in profound ways. Then there’s Atlas Shrugged, which seems to be the favorite tome of eccentric senior partner Bert Cooper. The book has come up multiple times as a way for Cooper establish a connection with Don and to show that he values Draper’s considerable abilities. “Tapping a Maple Tree on a Cold Vermont Morning,” by account executive Ken Cosgrove, published in the Atlantic Monthly to the dismay of his jealous peers. “Death is My Client,” an unpublished one-act play by Paul Kinsey, performed impromptu at an office party. Cosgrove’s two unpublished novels- one about an oil-rig rough-neck who moves to Manhattan, and the other about a widow trying to keep up her family farm. And of course, who wouldn’t like to take a peek at Roger Sterling’s memoir, his lackluster answer to David Ogilvy’s Confessions of an Advertising Man? Any other fans of the show? And even if you’re not, do you look up books you see on tv? Yes! I'm totally curious about Ken Cosgrove and Pete Campbell's stories too! I've also wondered if Meditations in an Emergency is any good. I never really gave it much thought, to be honest...but now that you mention it, it will be one more thing to pay attention to and one more reason it is the best show ever made! Now to get back to my own mad ave.